The world of pop-up books is HUGE. Before starting to explore the world of children’s literature in depth, I didn’t realize just how many different variations there are in this genre. Or the interesting history behind them. Because there is SO MUCH information on this topic, this page will only focus on some of the most popular movable (pop-up) books on the market today, along with the names of a few of the most well-known “paper engineers” creating those books. You can learn about the history of this fascinating genre of children’s books here. As time goes on, I’ll be adding more pages on this topic, which you’ll be able to see through links on this page. ABC3D by Marion Bataille is an incredible book, even by the standards of world-renowned paper engineer Robert Sabuda. According to a review in Publisher’s Weekly, Sabuda called Bataille’s book “one of the most delightful and innovative pop-up books I have ever seen.” The book was published in fall of 2008. ABC Disney: An Alphabet Pop-Up is one of Robert Sabuda’s most popular books. First published in 1998, Disney Press came out with this anniversary edition in March 2009. Of all the paper engineers currently producing books for kids, David Carter is probably the best at abstract pieces of art. I was lucky to see some of his artwork in person at a local art gallery (Blue Line Gallery in Roseville, California). He’s got a fun, interactive website too. Be sure to take a look at it! 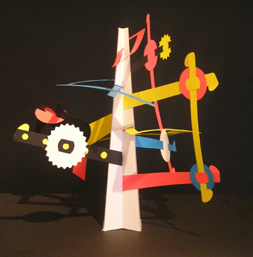 Color Surprises: A Pop-Up Book (by Chuck Murphy) is an excellent example of abstract 3D artwork. Forty reviewers on Amazon have given this book a 5-star rating. The book is not only filled with brightly colored graphics, but also with cleverly designed paper animals that appear and disappear in a variety of ways on each page. If David Carter is the master of the abstract pop-up, then Robert Sabuda may well be the world’s best creator of movable books based on fairy tales, nursery rhymes, and favorite stories that have been around for decades, if not longer. Two that come to mind are Lewis Carroll’s Alice’s Adventures in Wonderland and J.M. Barrie’s Peter Pan. 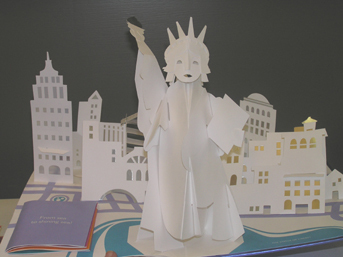 Matthew Reinhart is another world-famous paper engineer and creator of pop-up children’s books. Shortly before entering medical school, Reinhart met Robert Sabuda, who convinced Reinhart to follow his “true calling.” Since then, he’s collaborated with Sabuda on several paper-engineered books. Author/editor Jessica Rae Patton wrote an interesting article about Sabuda and Reinhart for Teaching K-8 Magazine, titled ”A Cut Above”. Reinhart’s got a fun blog too. Curious to know more about this fascinating genre of children’s literature? You might want to join The Movable Book Society, an organization formed in 1993 for artists, curators, booksellers, and enthusiasts of movable books. 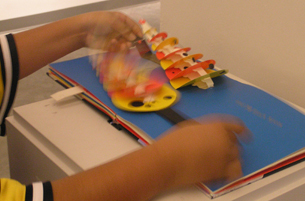 Need to Repair a Pop-Up Book?